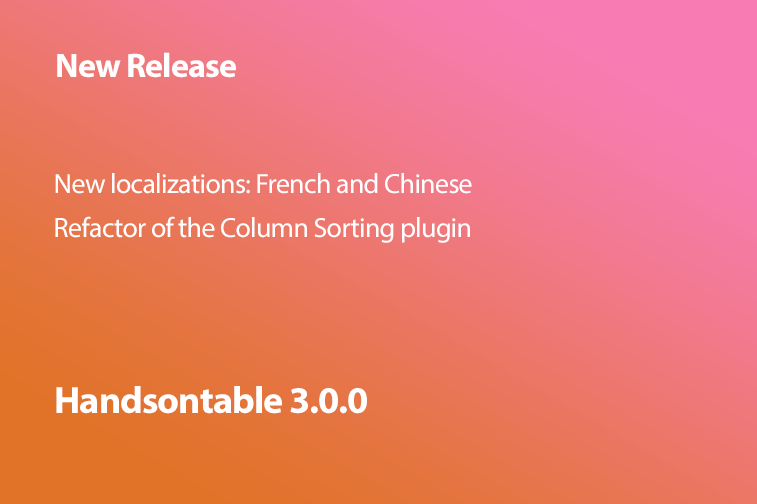 We are pleased to confirm that Handsontable (CE/Pro) 3.0.0 has been released today. We added three new localizations for Chinese-CN, Chinese-TW and French-FR. Many thanks to all GitHub contributors to these localizations. In this version we also fixed some issues that were identified as regression-type or high priority, including sorting, minSpareRows and selection. See the list below for more details. The sortOrder property now accepts string values (asc, desc, none). It previously accepted booleans (true for ascending order, false for descending order, undefined for default order). The Gantt Chart plugin now allows generating year-related data for years other than the one currently displayed. (#67) Along the way, some of its API methods became private.